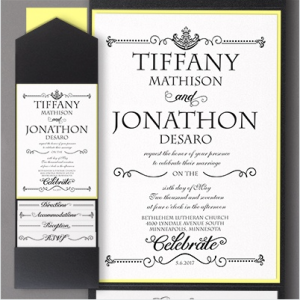 And I Quote Invitations > ON TREND Invitation Styles! 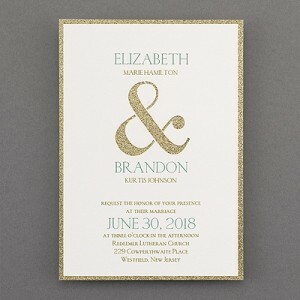 It All Shimmers Customized Wedding Invitation! 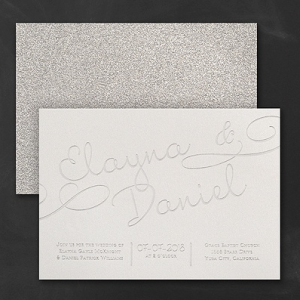 Paper: White Shimmer 105 lb, Silver Glitter 40 lb. 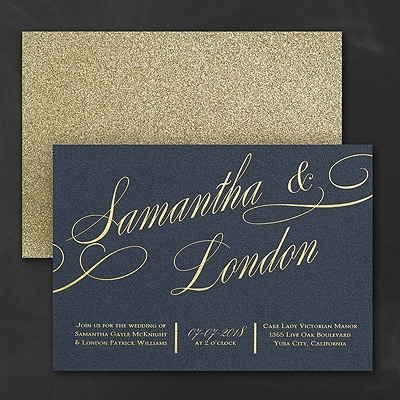 Paper: Navy Shimmer 105 lb., Gold Glitter 40 lb. 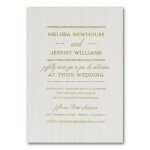 *AVAILABLE IN 36 DIFFERENT POCKET & LAYER COLORS! 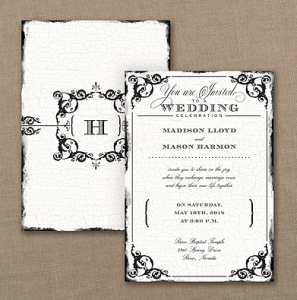 Follow your avenue of dreams with this elegantly whimsical layered pocket invitation. 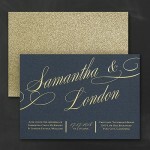 Pocket Paper: Black Shimmer 105 lb. 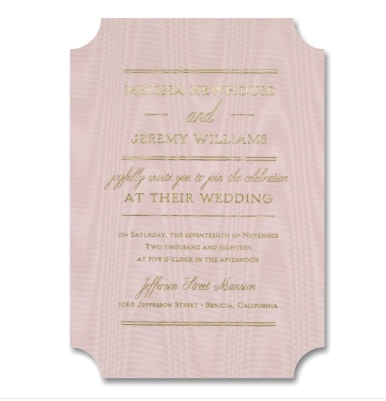 *AVAILABLE IN 10 DIFFERENT FABRICS & 5 DIFFERENT SHAPES! 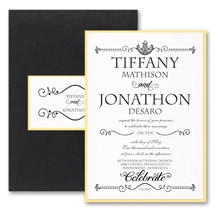 Your big news is all lined up luxe style in your choice of foil color on this black moire wedding invitation. Choose the trim option for style. Paper: Moire Pattern Black 114 lb. 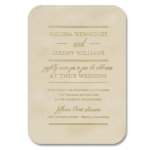 *AVAILABLE IN 3 DIFFERENT VELVET COLORS! Velvety. Crest shaped. 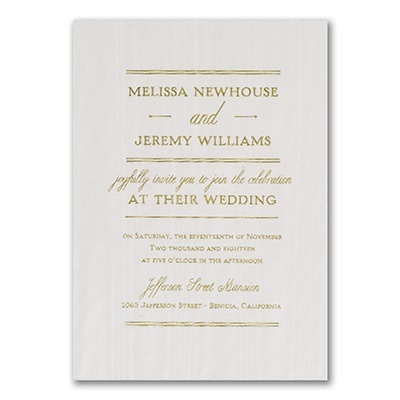 Foil printing. 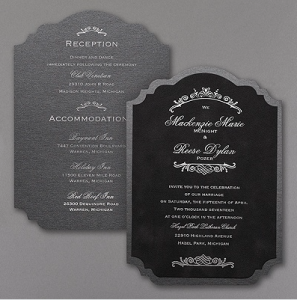 A black velvet wedding invitation so rich and so vogue is the only way to introduce your glamorous big day. 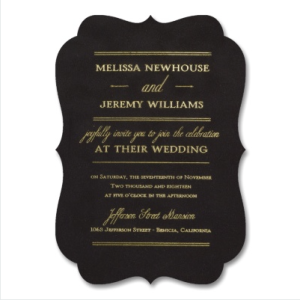 Paper: Black Velveteen 114 lb. 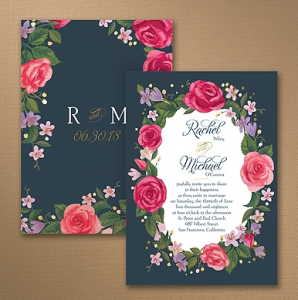 Romantic gets dramatic on this wedding invitation! Vintage pink roses and a black background draw attention to your big news. 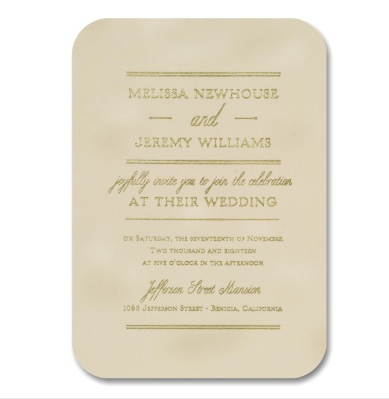 Choose the foil color for the accents.